The stories in What We Do with the Wreckage are about finding resilience in the face of adversity. Following losses big and small, environmental and familial, universal and personal, the best of us try to recover and rebuild. 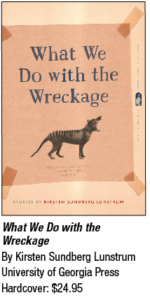 Kirsten Sundberg Lunstrum, the book’s author, asks how do we keep going in the face of grief or disappointment when love fails or disaster strikes? How do we maintain the stamina to carry on in an uncertain world? The characters in her stories are living these questions and learning to reconstruct themselves, their families and their futures from the wreckage of their broken pasts. Lunstrum is the author of two other collections of short fiction: This Life She’s Chosen and Swimming with Strangers. Her short fiction and essays have appeared in journals, including One Story, the American Scholar, Willow Springs and Southern Humanities Review. She is also a recipient of a PEN/O. Henry Prize and teaches high school English near Seattle, Washington.